Positioned in a premier location within walking distance to the beach, this near-new executive residence luxuriates convenience and style complete with high-quality finishes. From this closed pocket of east Woonona, a casual stroll will take you to the stunning shores of Woonona Beach and Rock Pool where white sands and sparkling waters beckon. Surrounded by parks, reserves, and cycleways, there is so much for you to explore from your very own doorstep. 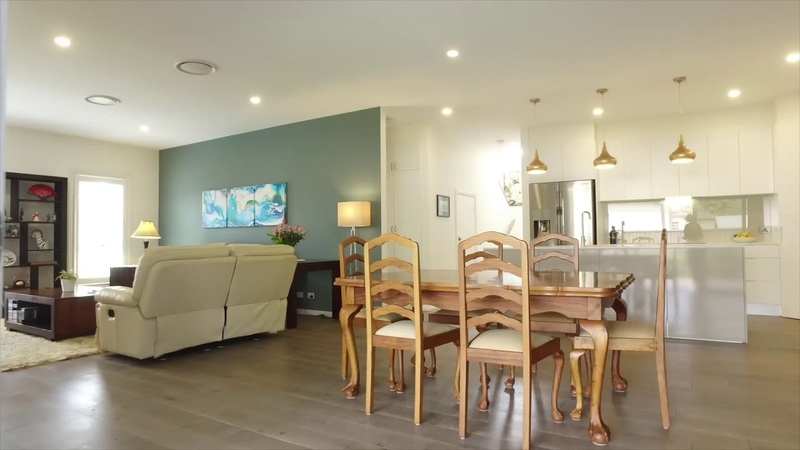 The vibrant township of Woonona is moments away, and it is here where you will find cafes, restaurants, shops, medical facilities, and services. Highly regarded schools including Woonona East Public School and Woonona High School are also nearby. Bus links and the Woonona Train Station are within walking distance, whilst Sydney is just over an hour drive and Wollongong CBD accessible in under 15 minutes. Boasting exquisite street appeal with perfectly manicured gardens and a lush green lawn, upon stepping inside, you will be amazed at the spacious interior. Fresh and light coastal interiors harmoniously blend with a neutral palette creating a casual yet modern elegance throughout the home. Sprawled across 2 levels of luxury living, the lower level features an open plan layout with an ultra-modern kitchen overlooking the dining and lounge. Sleek and sophisticated, the designer kitchen features quality stainless steel appliances, glass splashbacks and handleless cupboards and drawers for a clean, minimalistic look. Double glass sliders flood the living areas with plenty of natural light and open onto the covered entertaining area. Here, you can BBQ in comfort all year round in this tranquil setting surrounded by low-maintenance lawn and gardens. On this level, you will also find the master bedroom which includes an ensuite featuring his and hers sinks and a walk-in shower. With all you need on one level, the empty nesters can live downstairs or alternatively' this suite could also be used for visiting guests or extended families while younger parents and the kids sleep upstairs. A beautiful staircase leads you to the top level where you will find 2 double sized bedrooms plus an additional 4th bedroom/study. Servicing these bedrooms is yet another deluxe bathroom complete with separate toilet. Featuring a long list of quality extra's, this high caliber home is fitted with gorgeous plantation shutters, ducted air-conditioning and loads of storage space, as well as an internal laundry, additional powder room, and a double lock-up garage. With many of the rooms north facing, this solar-ready home also provides maximum energy efficiency. Installed with a water-to-house rainwater tank, energy efficient lighting, and glass, as well as roof and wall insulation, the family can live in comfort all year round without worrying about hefty electricity bills! Near new and move in ready, this home is perfect for those who desire a carefree coastal lifestyle. Sure to impress, this residence delivers on space and style yet requires little maintenance and upkeep freeing up your weekends – giving you more time to hit the beach! Appealing to a broad range of buyers seeking a premium home in an excellent location.